For most couples, the honeymoon is all about romantic dates, candlelight dinners and a trip to some fascinating honeymoon destinations. For me, the honeymoon was a different experience where there were no candlelight dinners, no freezing climate or valleys filled with natural beauty. Even though my marriage was on the 23rd of January, my honeymoon was one month after on the 25th of February. One main reason for this sweet delay was the tradition of Kerala were newlyweds are supposed to visit their close relatives. To be honest it took one whole month for me and my husband to finish with the “Virunnu”. After all the post-marriage rituals we started with our small honeymoon trip on the 25th of February. Even though we were born and brought up in Kerala, we decided to travel to some beautiful destination within the state as there was a number of fascinating travel destinations in Kerala we have never toured to. Just because the honeymoon tours are not a time to be stressed or tensed we decided to avail a couple package to Trivandrum organised by Le Lagoon Holidays which was one of the best travel operators in Kerala. One main reason for us to select Trivandrum as our honeymoon destination is that the stare houses a number of attractions and destinations with important which we have not explore. Yes, that is right; even after being born and brought up in Kerala we have not yet explored the capital city of the state. Finally, after taking leaves from our workstation we reached the Kochi international airport by about 7 am to fly to the capital city. After a flight of about an hour or so, we reached the Trivandrum airport where we were welcomed by the travel operators in the place. After completing the formalities we were walked to the taxi that was waiting for us. After travelling for about 30 min we reached our hotel which was pre-booked for us so that we could freshen up and leave the luggage in the hotel. After having the breakfast from the hotel restaurant we decided to start with our sightseeing by around 9 am. Our trip was completely organised by the travel operators depending on the timings in different destinations which were included in the itinerary. As per our plan, the first destination to be explored in the capital city was The Kanakakunnu Palace. Located in the heart of the capital city the palace was located close to the Napier Museum. 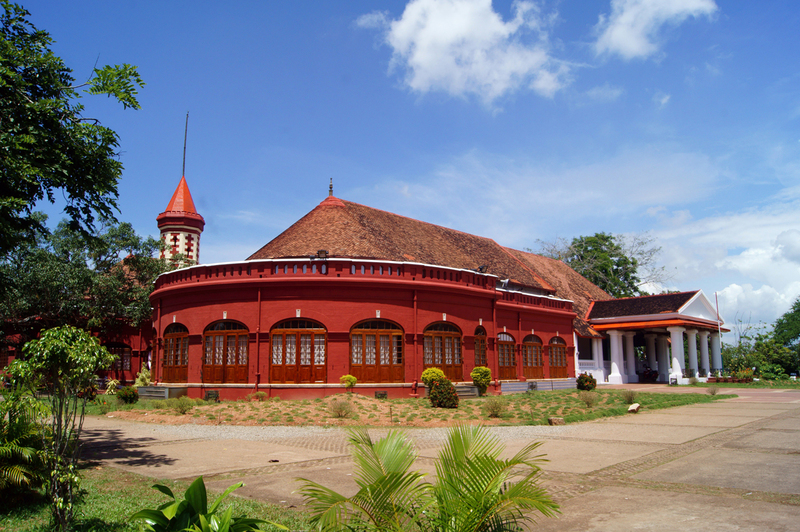 It was after travelling for about 30 min we reached the museum which was built under the Travancore kingdom. One of the main elements that would attract any traveller to the place is the traditional architectural style of the palace which is fascinating and breathtaking. Once under the Travancore kingdom, the palace is now protected by the tourism department of the state. At present, the Kanakakunnu Palace serves as a venue for a number of cultural meets and programmes. An all India Dance Festival is organised by the travel and tourism department every year in the month of October to March which attracts a number of travellers and honeymooners to the palace. While exploring the palace we were spellbound by the lavishness the place holds in. Inside the palace, you could see massive crystal chandeliers and an array of royal furniture which is an evidence of the lavish lifestyle of the kingdom. After exploring the palace and its richness for a while we moved on to our next destination of the day, Neyyar Dam & Wildlife Sanctuary. Located at a distance of about 32 km from the capital city the Neyyar Dam & Wildlife Sanctuary is one of the best destinations for couples and honeymooners. We reached this scenic destination after travelling for about 1 hr from the palace. The Neyyar Dam & Wildlife Sanctuary offers the travellers with the best part of nature. Mostly known as a fascinating picnic spot the place is mostly visited by travellers, honeymooners and families. One of the main reasons for us to travel to the place it is to enjoy a hiking through the wilderness. Apart from the sanctuary, the dam nearby is known to house a number of other attractions like a beautiful Watch Tower, a Lion Safari Park a Deer Park, and a Crocodile Rehabilitation and Research Centre too. The sanctuary also attracts a number of travellers to the place with its unique flora and fauna which includes the Asian Elephant, tiger, leopard, Slender Loris, King Cobra, Travancore Tortoise, etc. By the time we finished exploring the place, it was already 4pm as we had no much time to explore the next destinations we decided to move on to the Shangumugham Beach which was an ideal destination to enjoy a beautiful sunset. After travelling for another hour we reached the beach which was the best destination for honeymooners to enjoy the silence far from the city and its pollution. We sat in the place for a while enjoying the beauty of the setting sky and the palm-fringed shores. After enjoying the beautiful sunset we started our ride back to the hotel. We reached our room by around 8 pm and after refreshing and having the dinner we turned out the lights to get a good night sleep. Next day we woke up at around 8 am, after refreshing and having the dinner we checked out of the hotel by 11 am as it was our last day in the capital city. As it was our last day and had no much destination to visit we decided to go for a shopping at the Chelae Bazaar. After travelling for about 1.30 hours we finally reached the market. One of the main attractions of the place was that the market was one of the oldest Indian markets which spread on a stretch of 2 km connecting Killipalam and East Fort. The place was famous for its collection of fruits, vegetables, jewellery, electronics, dress shops and more. Most of the honeymooners and travellers visiting the capital explore this market so as to get back something with them as a memory while travelling back home. We too bought some dress materials and jewellery from the place. After shopping for a while we decided to get back to our home. As we flew from Kochi to Trivandrum first, we decided to travel by road back to home. After travelling for about 4 hrs we finally reached our home. Trivandrum was one of the best destinations to the south most tips of Kerala where you could enjoy a number of different attractions. Being the capital city and one of the best-known travel destinations for overseas travellers who wish to explore the heritage of Kerala the place houses a number of travel operators offering the best tour packages. Most of the overseas travellers and domestic tourist trip to Trivandrum just to explore its beaches and a number of other fascinating destinations like The Zoological Park, Sree Padmanabhaswamy Temple, Napier Museum, Poovar Island, Agastya Mala, Sri Chitram Art Gallery and many more. The capital city of Kerala, Trivandrum is undoubtedly one of the best and most fascinating tourist destinations for couples, honeymooners, history lovers and travellers with an interest in the heritage of the state.